Biomedical research is a challenging complex process, to say the least, from the level of molecules right up to the entire organ systems interacting with one another. Biomedical researchers need apparatuses capable of simulating this level of complexity and animal testing is usually one of the first contenders. Fortunately, the past century has seen an explosion in the availability of animal-friendly investigative tools, such as non-invasive imaging, antibody production and cell cultures, in humanity’s arsenal in the fight against ignorance and disease, nonetheless, none of them completely replicates the complexity of a living organism; a delicate issue facing the scientific community when trying to balance the essential needs of research and the desire to eliminate animal testing. This incessant delicate issue brought to light yet again as the recent Santa Cruz Biotechnology fine news broke to reveal the giant’s deepest secret. The Dallas based company was hit with a hefty $3.5 million fine after the USDA filed three consecutive complaints asserting “repeated failure to provide minimally adequate and expeditious veterinary care and treatment to animals”, which resulted in the closure of their research laboratory and losing their animal dealer license. While giant companies and big names struggle to balance animal rights and mankind’s well being, the recent safer alternatives become more feasible. Take monoclonal antibodies (mAbs) production for example, a ubiquitous tool in therapeutic medicine and biomedical research, used to treat, diagnose and research disease. However, some of the most common methods used are not entirely humane. While the mouse ascites method of mAb production is generally discouraged due to the significant animal pain and distress involved, it has become standard in the field. Fortunately, a complementary method to animal-based mAbs exists in the form of synthetic antibodies called recombinant antibodies (rAbs). The recombinant antibody in question here converts available hybridoma cell lines into recombinant DNA, making antibody through cell culture, instead of mouse ascites method. 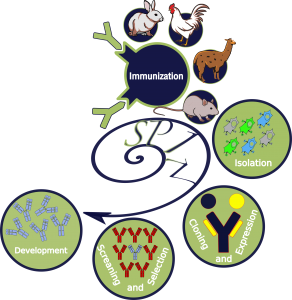 Monoclonal antibody production using the high yield recombinant transient expression method, developed by ExonBio, is an ethically sound and one of the viable alternatives to animal-based mAbs production. The recombinant transient method is definitely more humane than the ascites method. It eliminates the major animal welfare concerns associated with traditional monoclonal antibody production, such as ascites hybridoma expansion, euthanasia, and animal immunizations. For instance, in the ascites method, the cells are injected directly into the peritoneal cavity of a mouse using in-vitro cell culture techniques, which is painful and life threatening. The Hybridoma cells multiply and produce a fluid known as ascites in the abdomen, and it is this fluid that contains the needed antibody. The recombinant transient expression method, devised over decades after lots of research and efforts, gives elevated levels of usage due to the higher demand being met without indulging in unethical animal practices. The V-regions of the antibody heavy and light chain genes are extracted from the Hybridoma cell. The V-regions are fused with the constant region of the heavy and light chains respectively and cloned into a mammalian expression vector. The plasmids can be preserved as stable DNA and a digital sequence data. The plasmids are transiently expressed into HEK293 or CHO suspension cells in serum-free culture, at scale of Wave bioreactor, which could yield grams of antibody. Uses cell line: HEK293, CHO in serum-free, suspension culture, eliminating animal IgG contamination issues. Complete control of the process in comparison to ascites method where you can lose control after injecting the hybridoma cells into an animal. Easy with quality control and more reliable and repeatable production. Although without the ability to use animals in research, scientific advancement would be massively hindered, technology come a long way to allow for viable substitutions. Hence looking at the many benefits, the ExonBio recombinant antibody technology is sufficiently advanced for research and implementation and should be applied accordingly to serve the purpose well. It is scientifically endorsed and has fundamental benefits not available in animal-based antibody production methods.